Elisa Kefi and her 63-year-old sister brave the heat and sit on the side of the street selling nuts and small vegetables in Timor-Leste’s Oecusse enclave. “The government doesn’t really pay us much attention, but we still have to look for money to feed our families,” said mother-of-three Kefi, 37. If they sell everything, they can make up to US$5, but usually they only pocket $2 a day. Life is hard in Oecusse, sandwiched between Indonesian West Timor and the Savu Sea. The Portuguese landed in the 15th century and kept Oecusse after dividing up Timor island with the Dutch, who arrived the next century in modern-day West Timor. In 1999, after almost 80 percent of Timor-Leste voted in favour of independence from Indonesia, ending a bloody 24-year occupation by the Indonesian military, Oecusse bore the brunt of the wrath of the departing military, which destroyed most of the infrastructure and two-thirds of homes. Today, the region of 815 sqkm surrounded by Indonesia, a little bigger than Singapore, is still one of the world’s youngest and poorest. With no Indonesian consulate and only two, 12-hour ferry rides to the capital Dili each week, the 80,000 or so inhabitants, most of whom live in the mountains, struggle on. Kefi and her sister are also part of a 10-strong group of traditional tais weavers, who can make up to $300 a month by selling their products in Dili. The main issue we are dealing with is how to increase the income of the people because the people now are still in the transition stage from subsistence farming to the introduction of cash crops. Trading locally produced products is key to alleviating poverty in Oecusse, according to Jorge Teme, Timor-Leste’s Secretary of State for the area. “The main issue we are dealing with is how to increase the income of the people because the people now are still in the transition stage from subsistence farming to the introduction of cash crops,” he said. Paul Joicey, country director for Oxfam's Timor-Leste programme, told IRIN that diversifying crops, better access to seeds and training, and moving away from slash-and-burn techniques are crucial. 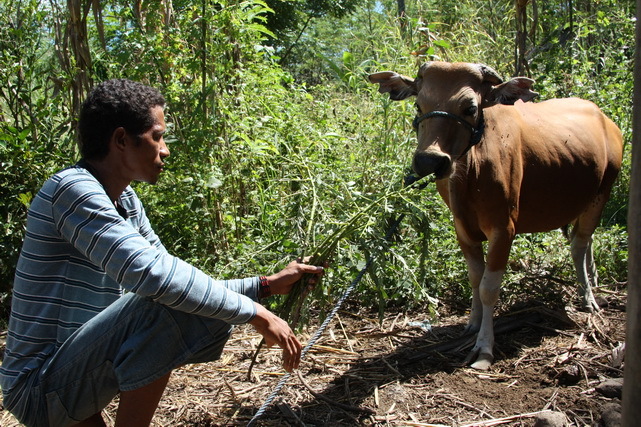 Cooperativa Café Timor (CCT) is working in Oecusse on a cattle-management programme. Cattle farmers in Oecusse usually maintain their livestock individually and struggle to find buyers. AusAID funds a matchmaking team from Peace Dividend Trust (PDT) that connects CCT with those farmers. Buffaloes are bought and collected by CCT and then given to local groups to fatten up until they can be exported to Indonesia. “CCT gets 30 percent and the communities get 70 percent of the money. There are 59 groups in all of about 10 to 50 people each. The groups keep the buffaloes for a year or a year-and-a-half,” CCT coordinator, Diolindo Sequeira, told IRIN. Between February 2009 and February 2010, PDT’s matchmaking team in Oecusse facilitated 150 requests from CCT for 450 buffaloes valued at almost $67,000. Since the border with West Timor was sealed, trade with Indonesia has decreased. However, even selling goods locally is tricky given the dire state of the roads and lack of access to transport and communications. Travel to West Timor requires a trip to Dili for a passport and visa. Most farmers see little incentive to step up production but the government plans to counter this by setting up a district-based cooperative. “We help some of them with connections so they can lobby the UN or other international agencies to sell the local products,” said Joseph Hornai, PDT’s representative in Oecusse. According to government data, more than three-fifths of children under five in Oecusse are undernourished and 92 of every 1,000 children under five will die. Infrastructure is barely existent and rural communities get water three times a week for two hours creating a dependency on rainwater, which causes problems during the dry months from April to November. Furthermore, only five of 19 villages have electricity for at most a few hours a day.